Only typical sources are listed; inquiries are invited for alternative capsule designs and activities. For medium energy Beta gauging applications, these Pm-147 sources offer a radionuclide with beta energies up to ~225keV. The activity is contained within a stable, homogeneous active element. Single-encapsulated source with thin end window. Available in stainless steel, platinum/iridium, titanium or nickel. ISO rating: C22232. 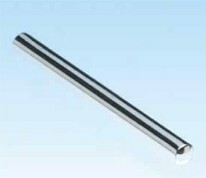 Maximum length of Dimension A is 0.180”/4.57mm.